After Alexandre Vinokourov’s sixth overall and spell in the Maglia Rosa last year, the Astana team is heading back to the race with a different leader and higher objectives. Czech rider Roman Kreuziger will get his chance to lead a Grand Tour team, being the Kazakh team’s designated captain for the three week event. Set to celebrate his 25th birthday on Friday, Kreuziger previously won the Tour de Suisse and twice finished ninth overall in the Tour de France. He showed his increasing form lately when he finished fourth in Liège-Bastogne-Liège, and team manager Giuseppe Martinelli believes he’s ready for a big performance. A solid team has been set up around him, with the climbers Josep Jufre, Robert Kiserlovski, Francesco Masciarelli, Evgeny Petrov and Paolo Tiralongo ready to put their weight behind him in the mountains, and Alexandr Dyachenko, Maxim Gourov and Gorazd Stangelj ready to do the same on flatter and undulating terrain. Kiserlovski is another who wasn’t originally envisaged as part of the team. 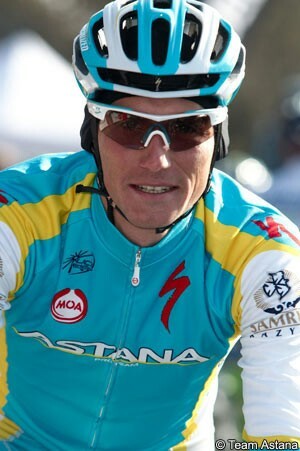 He had a dramatic crash in Paris-Nice, falling on the rain-washed seventh stage and ending up under a parked truck. He recently pulled out of the Tour de Romandie with a suspected cracked vertebra dating back to that crash. However that injury has subsequently been downgraded after a MRI was carried out. Vinokourov will lead the team in what is likely to be his final Tour de France, and will require Kreuziger’s backing there. The Giro is the Czech rider’s big chance to chase a top three placing in a Grand Tour, and he has been working hard to ensure he’s in the best shape possible.